Our beginners classes are very popular so please contact us to register your interest in advance. Karate is a great form of exercise which provides a whole body workout with an emphasis on balance, coordination and aerobic fitness. The complex movements required by karate also challenge the mind and fully engage the student, child or adult, as they try to master the stances and blocks, punches and kicks, plus Japanese terms and language. While the techniques of karate are unquestionably effective for combat or self-defence, but more importantly karate promotes self control, self respect and respect for others. Importantly karate teaches non-violence and is anti-bullying. The introductory course is for anyone and everyone, and trust us when we say that ANYONE can do it, it’s all about personal improvement and reaching your own goals, whether it’s fitness, confidence, flexibility, strength or just making new friends. Whatever your reasons to join you can be sure you will have plenty of fun. Course leader: Paul James, 6th Dan Black Belt and Chief Instructor to Ikkyo Karate group in Aberystwyth. Sensei James has been training and teaching karate for nearly 30 years and his experiences extend from being a young, awkward and clumsy beginner through to National and World Champion. 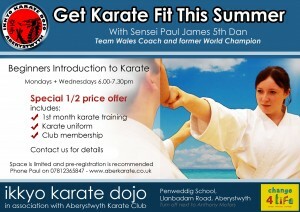 He is currently the Kata Coach for the International Welsh Team which is regarded as one of the strongest in the World. “I have been very fortunate along this fantastic journey and take great pleasure in helping others strive to better themselves through practising martial arts. He is CRB checked and fully certified and insured through the Karate Union of Great Britain. You will not have to fight. You will learn lots of techniques before you are introduced to basic sparring work. You will not get injured. Karate has very few injury related incidents, and is very safe to do with the right people. You will not feel intimidated. At no point will you be left in at the ‘deep end’ and nothing is expected of you when you start. You will not be pushed beyond your limits. Karate training is gradual, as your fitness increases you will be able to push yourself. Who can start karate training? Ikkyo Karate generally take students from 7 years old. A misconception people make about karate is that you have to be young and fit to start karate training, in fact some of the best karate students are those that start training well into their adulthood, making it through the grades all the way to black belt. Occasionally we take children ages 6 and below. We recognise that younger children require a very different approach and we find it helps when a group of children of a similar age starting together so that we can focus the class to a particular group, it also makes it easier for them to make new friends. If you have a young child that wants to train please contact us and we’ll find the best time for them to start. *Discounts are available to families, students and group bookings. Enquire for further details. Places on the beginners course are limited as we like to keep classes small, so please reserve a space in advance. For more details contact us or call Paul on 07812365847.